A personal reflection by Alexis. The quote above is from Rear Admiral David Titley, Chief Oceanographer of the US Navy. He was a climate sceptic, but the changing Arctic convinced him too. A drip‐feed of worsening environmental news stored away in the recesses of my brain became a personal tipping point back in 2005 when I read about the demise of the Arctic ice on the front page of The Independent. This was a seismic shift in my understanding of what was happening. Suddenly I saw the need for change – by me and by human society as a whole. Not because of the polar bears – although the recent news that polar bear cubs are struggling to swim the larger distances melting sea ice implies is tragic — but because the existence of ice at the North Pole is one of the fundamentals of our world and when you start looking behind the melting ice it is clear that we are in deep trouble. 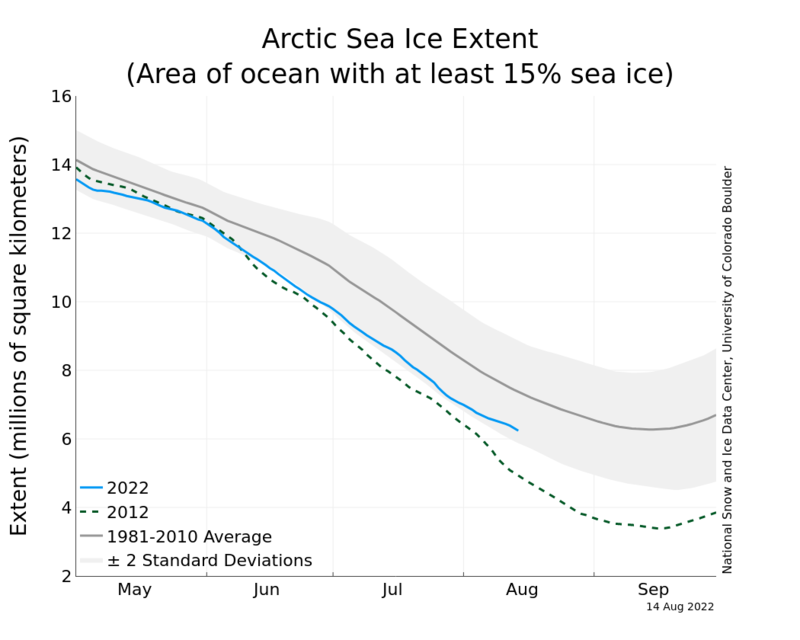 As the ice melts in the Arctic fewer of the sun’s rays are reflected back out into space. The water is dark and so absorbs solar radiation and heats up. This is called the ice‐albedo effect and is one of a number of reasons why the Arctic is heating up faster than the rest of the planet. Other reasons include the fact that colder air holds less water vapour than warmer air. As a result a greater fraction of any increase in radiation absorbed by the surface goes directly into warming the atmosphere. By contrast, in the tropics, a greater fraction goes into evaporation. What nobody knows is when a disastrous tipping point, or tipping points, will be reached, when the melting and warming will be unstoppable and when it will provoke other catastrophic changes. The melting ice will also allow the release of frozen carbon in the Arctic Circle. (15) However, worst of all will be releases of methane from frozen stores in the sea bed, land and lakes. In climate change terms methane is the stuff of nightmares; it has a greenhouse effect 40 times greater than CO2 and has the capacity to push current climate change trajectories into another dimension if it defrosts and enters the atmosphere. As with sea ice, there may be a point at which the methane release becomes self perpetuating — it may become unstoppable, with dire global consequences. It’s like watching dominoes fall, each falling domino knocking the next one over. The first few dominoes have fallen and the chain reaction is under way — almost inevitably leading to enormous releases of methane, unless we intervene. Sea ice restoration could be a normal habitat restoration project. We do this all the time in environmental management. It’s like planting trees after deforestation or cleaning up after an oil spill. We now need to re‐stabilise a key part of the Earth’s temperature regulation system — the coolness of the Arctic. Above all we must retain the methane in its frozen state. The Arctic has become not only the most potent symbol of how climate change is affecting the planet, but also of the short‐sighted nature of 21st century man. Even as we fall over the cliff we will be grasping at the air and trying to sell it for a profit. Alexis Rowell is a communicator and business developer in the world of sustainability. He does anything and everything, so long as it’s about inspiring people to take environmental action, or helping businesses and organisations to be more sustainable.